The Lion Ballroom was originally built as part of the Lion Hotel in 1840. It opened in 1843 with a celebration dinner and a new year ball for 1844, attended by local dignitaries. In 1851, the Lion Hotel went bankrupt. The Hotel and the Ballroom eventually closing in 1854. The ballroom survived, although housing various buisnesses including an ironmongery business. In the later years it was used, in part, as storage for Leominster Farm Supplies. The owners of which (John and Stuart Hinton) oversaw the restoration of the room to its former glory, reopening as a Grand Ballroom in 1997. 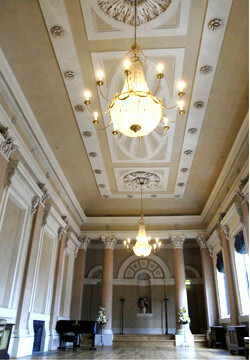 The main ballroom is 51 feet by 22 feet, allowing seating capacity of around 120. There is a raised dais or stage of approximately 6 feet by 22 feet. It now provides a space for classes such as keep-fit, dance, choral rehearsal etc. There is a full annual programme of concerts, films, exhibitions etc. The room is also for hire for other people to put on similar events, as well as parties, wedding receptions, conferences etc. The Lion Ballroom has become well-known as an arts venue in Leominster. Facilities include parking close by; toilets (including disabled) on the ground floor; a lift to the first floor where events take place, new kitchen facilities; a wide range of equipment if needed, such as large projection screen, slide and overhead projector, microphone and stand, tie-clip microphone, amplification system with CD player and speakers, 6 large display screens and 12 large tables and 8 small tables; and a Green Room for artists, meetings,interviews etc. The Ballroom now has a Hearing Loop System.